If cabin fever sets in after you shovel out, Twin Cities specialty retailers have deals waiting for you this weekend. 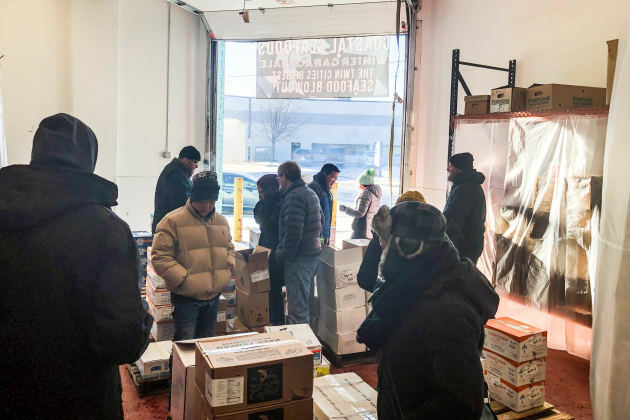 Coastal Seafoods had such success with its last warehouse sale on frozen fish that it's doing one in advance of Valentine's Day, featuring shrimp, crab, lobster and some fin-fish by the case. The last sale in January sold out of more than 5,000 pounds of frozen seafoods in just three hours, so the company brought it back by demand for sweethearts. Prices are discounted about 30 percent for cases weighing 10 to 30 pounds. The Saturday sale takes place from 10 a.m. to 4 p.m. in Coastal’s dock area along E. 24th St in back of the store at 2330 Minnehaha Ave. S., Minneapolis. Customers will receive free samples of smoked Arctic char chowder before and during the sale. On Saturday and Sunday, Blu Dot, the Minneapolis-based modern furniture company, is bringing in a couple of other local retailers to its outlet. Askov Finlayson and Idun women's boutique are liquidating their clearance at the furniture outlet. Both apparel retailers are discounting everything 70 percent or more. "This is our final clearance of remaining inventory as we shift our full focus to the creation of new product under the Askov Finlayson brand," said Askov co-owner Eric Dayton. Selection includes men's pants, shirts, sweaters, knits, shoes, bags and leather goods at 75 to 80 percent off. Idun, pronounced Eden, is a St. Paul women's boutique selling casual, comfortable, free-flowing apparel. Owner Dahlia Brue said she will send more than 100 pieces discounted 70 percent or more to the Blu Dot outlet sale. Blu Dot outlet isn't offering additional discounts on furniture and accessories this weekend, but spokeswoman Medora Danz said "the deals are deep at present," due to progressive markdowns. Hours for the Blu Dot, Askov and Idun sales are 10 a.m. to 4 p.m. Saturday and 11 a.m. to 3 p.m. Sunday, Feb. 9-10.